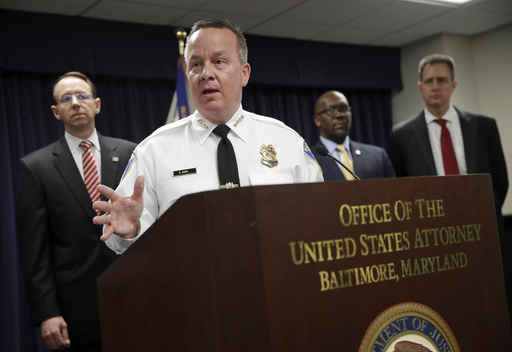 BALTIMORE (AP) — Seven officers assigned to a gun tracing task force stole money from victims they falsely detained, wrote fake police reports, lied to investigators and filed for overtime they didn’t work, according to a damning federal indictment that comes as the troubled Baltimore Police Department struggles with reforms. Federal prosecutors announced the indictment Wednesday in the city, where the police department entered into a consent decree with the U.S. Justice Department in the final days of the Obama administration, promising to stop abusive tactics and discriminatory practices that included unlawful stops of drivers and pedestrians. The officers were assigned to the Gun Trace Task Force, a squad formed to reduce violent crime by tracking and removing illegal guns from the streets. U.S. Attorney Rod Rosenstein said the investigation began about a year ago, and that as a result, his office “quietly dropped” five federal cases brought by one or more of the officers. Rosenstein said Baltimore State’s Attorney Marilyn Mosby wasn’t notified about the investigation until charges were filed. He expects her office to review its cases involving the officers, as well. The officers charged with racketeering are detectives Momodu Gondo, Evodio Hendrix, Daniel Hersl, Wayne Jenkins, Jemell Rayam, Marcus Taylor and Maurice Ward. Gondo also is charged with participating in a drug conspiracy. The explosive indictment reads more like a Hollywood movie script than a routine charging document, as the feds followed what they described as a squad of renegade officers committing brazen robberies of innocent residents and staging cover-ups to avoid detection by their supervisors. “These officers are 1930s-style gangers,” said Police Commissioner Kevin Davis. — Three of the officers stopped a man on the street, searched his car without a warrant, took him home and stole $1,500 he had earned working as a maintenance supervisor at a nursing home. Rayam then allegedly wrote a false incident report, not mentioning the stolen money, and Jenkins approved it. — Four of the officers arrested a man during a traffic stop and confiscated drugs and $21,500, but turned only $15,000 over as evidence. Then they went to the man’s home and stole $200,000 and a $4,000 wristwatch from a safe deposit box. Other details in the indictment point to officers flouting some of their department’s attempts at reform following the death of Freddie Gray, a young black man fatally injured in police custody in April 2015. Gray’s death prompted the Justice Department investigation that developed the proposed consent decree. The police department meanwhile reformed its policies and made changes such as requiring body cameras. In September, Gondo was recorded telling Rayam he had switched off his body camera before hitting a cellphone out of a woman’s hand. “I turned the camera off,” Gondo said. The officers also routinely filed for overtime pay for hours they didn’t work, the documents allege. Jenkins filed for five days when he was on vacation with his family, and other officers discussed going to a casino or a bar on days when they filed for overtime pay. “This is not about aggressive policing, it is about criminal conspiracy,” Rosenstein said. Davis acknowledged that much work must be done to right wrongs inside the department. Davis pledged to continue the “messy job” of reform, working closely with federal officials to root out corruption. Gene Ryan, Baltimore’s police union president, issued a statement saying he’s “disturbed” by the charges. He declined to make other comments.